There's one PCC with the front smashed in real good (the 3262), and the PCC it presumably rear-ended appears to be thousands of feet ahead of it, no apparent damage visible through the trees, but it is hard to tell. There's a double set of PCCs going the other way on the other track stopped next to the one with the smashed in nose. I'm curious as to the current state of the anti-collision technology being tested on this line and whether it played any role, or failed, or was inactive. 3260 is the other car. I'm not to familiar with their operation. How many cars do they need at peak service? I saw at http://www.transithistory.org/roster/ that now half the fleet is out of service. Will 5 cars be enough ? 5 cars meets minimum service requirements with a 0% spare ratio. The BFD tweeted out this shot of 3262. If http://www.transithistory.org/roster/ is up to date then, it seems that there are only 5 cars still left in service then? Doesn't sound very good. Is that sort of damage on 3262 easy (relatively speaking) to fix / does the MBTA have any alternative if they can't get the PCCs repaired? They seem to bustitute the line fairly often any time there's snow already though so I hope that doesn't become their long-term "solution." Bids are open for the PCC rebuild program, which is slated to overhaul the propulsion and trucks on 8 out of the 10 Mattapan PCC's. If one of these accident casualties doesn't end up a good value to repair, they simply swap out that unit for one of the long-term OOS 3234, 3238, 3265 grouping and arrive at 8 overhauled units all the same. So they aren't in any long-term danger of having too small a fleet to operate. I don't know when bids close and how soon after the contract is awarded that the T will be providing the winning vendor with the parts upgrade kits, so it's not yet known how long they'll have to skate on zero reserves (1 year? 2?). I would assume now, if it wasn't the plan all along, that the overhauls will target the OOS units first as a practicality of it being impossible to rotate out active units without harming headways. FWIW, the damage to 3262 doesn't look bad at all. It might be held OOS until the overhaul program before getting body work, but the front end is barely even dented. And they're designed to take a beating on the front-end because of the far more frequent streetcar-on-auto collisions at grade crossings and intersections, so most of that is probably superficial. I doubt it takes much cost or effort to repair that. It's simply a question of whether 3262 makes the cut for the 8 units slated for overhaul now or if it gets dropped into the final 2 remainder mothballed units TBD for any further repair action. But it's extremely unlikely that the vehicle is in any way totaled. Maybe Seashore has a PCC hulk from which body shell parts could be cut out and used to repair the Mattapan cars. As of two years ago there was a PCC hulk in the woods at Warehouse Point. Probably not necessary to scavenge for body parts unless photos from different angles show much more extensive damage than that one BPD close-up of 3262's front-end. Those kinds of dents can be pounded out with mallets and patched with bondo easily; dozens upon dozens of PCC's, Boeings, and Type 7's over the decades had front-end damage repaired the same way without requiring any parts donors whatsoever. At worst they're cutting a new sheet of aluminum as part of the patch prep, but the photo doesn't indicate any shredded metal whatsoever on the frame that would need to be cut off so pounding out the dents + smoothing over + patching probably does the job. Bumpers are quasi-expendables and aren't hard to fashion with sheet metal and rubber at Everett Shops if no extras are available, couplers are full-expendables that can be ordered new off-shelf, and windshield + windowframe liner are full-expendables still orderable to-spec from any number of glass shops because even museum PCC's need to have their windshields replaced every so many years. I hope MBTA does not use this as an excuse to diminish service. Wishing everyone speedy recovery from their injuries and hope no crew members were injured in this incident. 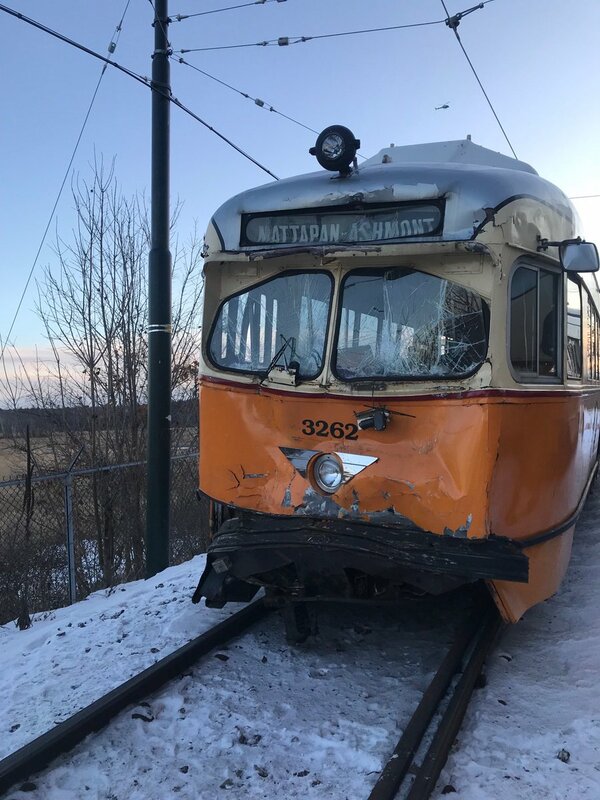 "MBTA says the Mattapan Line will run with four trolleys rather than the normal set of five until it repairs the two trolleys involved in the collision." Adams_Umass_Boston wrote: "MBTA says the Mattapan Line will run with four trolleys rather than the normal set of five until it repairs the two trolleys involved in the collision." Will this mean a reduced schedule (from the 5-minute headway on peak)? 1. Will there be a lot more instances when people have to wait for the next car due to overcrowding? 2. Will dwell time at stations be significantly increased due to people having to squeeze on and off more crowded cars? Last edited by CRail on Sun Dec 31, 2017 1:01 am, edited 1 time in total. That's a better outcome than "Temporarily Suspended."